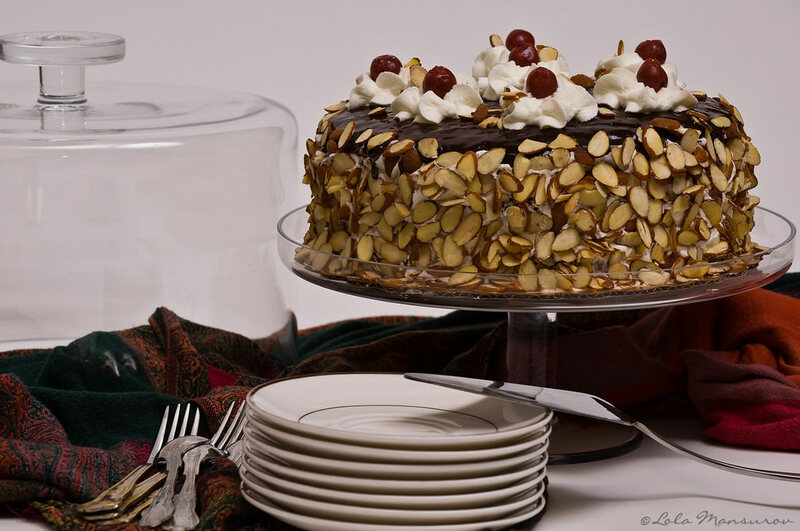 This particular recipe of Foret Noire Cake is very close to the Schwarzwäld cake and as I heard, is very popular among French and Germans. 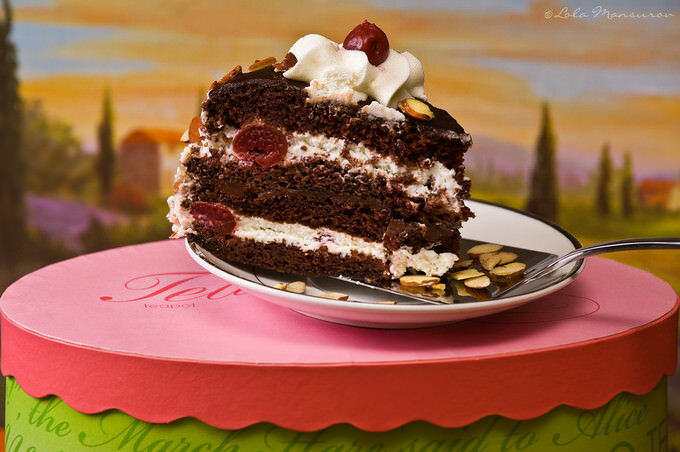 There are different methods used in making the Black Forest Cake, as it seems that the original version has been changed many times. I chose this particular one since I came to love it very much. My husband, on the other hand, really enjoys another recipe – Schwarzwälder Kirschtorte with its less chocolaty taste and rich cherry filling on the bottom layer. Cherries and Kirschwasser (a dry colorless brandy distilled from the fermented juice of the black morello cherry) are the main ingredients for the SchwarzwÃ¤ld cake. However, we eliminated the use of alcohol and replaced it with syrup under canned sour cherries. Schwarzwälder Kirschtorte takes a little longer to make compared to the Foret Noire. So, I decided to share easier recipe first. Preheat oven 360F, butter and flour two 9 inch, round cake pans. Cover the bottom of the pans with waxed papers. I use bottomless cake pans (the surface of the oven trays must be very even, otherwise your batter will run out of the pans). If you decide to use the bottomless cake pans, butter the sides of the pan. Put the waxed paper on baking tray and place the pan on the tray. Melt the margarine and let it cool. In a medium bowl combine baking soda, cocoa powder and flour. In another large bowl beat the eggs and sugar. Add combined dry ingredients to the egg mixture, add margarine. Beat well until ingredients blend well. Pour the batter into the previously prepared baking pans. Bake for 40 minutes or until fork or a wooden toothpick comes out clean when inserted to check for readiness. My advice to you is, when you put the batter to bake, do not open the door of the oven for the first 20 minutes. This will help for the batter to rise well. For this cake, the batter will not rise very high and it is normal. But we still need some volume. So, the first 20 minutes are very important. Beat whipping cream and sugar with an electric mixer at high speed until stiff peaks form. Put the frosting into the refrigerator. Using a small pan melt chocolate with milk on the stovetop. Once milk is blended with melted chocolate, take the pan down and let it cool a little. With a long serrated knife, split each cake layer horizontally in half. You can cut the dry sides evenly, crumb and keep them for the decoration of the cake. Divide frosting into two small and one bigger portions. Wet each cake layer with cherry syrup and place the first layer on the cake plate. Randomly place canned, pitted cherries on the cake layer and spread with smaller portion of the frosting. Put another layer on top and spread the chocolate mixture. Put the third layer on top of the chocolate. Place the rest of the cherries and spread the smaller portion of the frosting. Top with the fourth cake layer and frost the sides of the cake. Pat the reserved crumbs onto frosting on the sides. Spoon the reserved frosting into pastry bag and using a star decorator tip, decorate the cake. Use your imagination and decorate according to your own taste. lola i was wondering if i can substitute butter for margarine and if, then one to one or how much? Hello, I am new to this website, and was checking to see if the Black Forest Cake recipe is measured in US cups. Thank you!